When trouble comes it can be easier and quicker to simply reinstall. But to do a more complete reinstall there are ways to manually remove traces from the previous installation that includes deleting files and folders and registry keys. This is also useful in some cases when there are problems to just reinstall using "Add or Remove Programs" in Windows or "Programs and Features" in Vista. This document describes the steps to do that. Via AutoCAD Tips Newsletter that I can recommend to you as AutoCAD user. Thanks Ellen. Take a look at Ellen's website for more about AutoCAD as well as PowerPoint. Running VLIDE in AutoCAD is a surprise each time. Most times the icons are visible enough but sometimes it's hard to see because of the light colors. This is in AutoCAD 2008 I have taken these screenshots. This is a problem Autodesk is aware of but since VLIDE is such an old part of AutoCAD it's unlikely this problem will be fixed. I just tried Panda's free online NanoScan. I tried to run it before but now it works on Windows Vista. It took longer time to get it installed than to do the actual scan. It's an "instant" scanner that searches for viruses, spyware and other threats. It can detect, in less than a minute, a huge number of threats that could be running on your PC right now. This is great! What more can be said? It's free. In Access 2000 and Access 2003 there was a way to compacting the current database using this VBA code. It doesn't work in Access 2007. But it works when changed to this. The major problem is that you instead will get this error message. Instead of using a macro or code, click the Microsoft Office Button, point to Manage, and then click Compact and Repair Database. What I did was to use this code to make it compact when closed. And when loaded restore it to not Auto Compact when closed. As you can see below URL of links are not visible in the Internet Explorer status bar when using Google Reader. I have Windows Vista and IE7. The problem starts first after a while almost like the bug with the shortcut keys. I got a 30-day trial to Safari Books Online when I registered my copy of Adobe Acrobat 8. Below is what it look like when I searched for AutoCAD as an example. There where only three quite old books specifically about AutoCAD. There are many more books on subjects like databases, IT, programming, etc. 72 books matching the category "Visual Basic". 81 books matching the category ".NET". 67 books matching the category "SQL Server". 26 books matching the category "Adobe". The search functionality and overall impression of the site is good so far. Between $219.99 for a 10-Slot Tech Collection and $439.99 for unlimited access of an annual individual subscription. Is it worth it? I'm not sure yet. I usually don't buy and read that many books. Not so obvious is what 10-Slot Tech Collection really means. Notice that you need to keep a book on you bookshelf for 30 days. Slot values can range from one-half to three slots. Even if you only want to read one page of a book you need to add it to the bookshelf. Anyone of you that are using Safari Books Online or something like it? What alternatives are there? 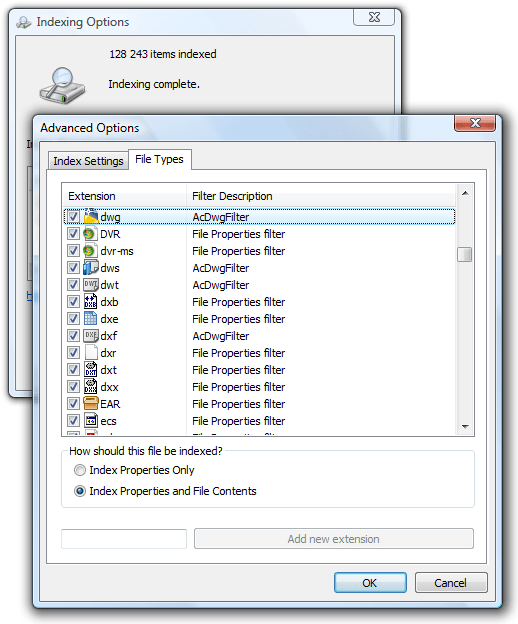 It should be possible to search and find information within DWG files using Windows Explorer with the help of the AcDwgFilter that is included with AutoCAD 2008. Is it only me or does not the search and find functionality in Windows Explorer work in AutoCAD 2008 on Windows Vista? On the topic there is a 3:rd party solution available. It seemed to work well in my limited tests. I hope to release our final within a few days. The 2007 version also works great with Windows Desktop Search! Here are some tips on panning in AutoCAD. In some earlier versions (up to AutoCAD 2006) of AutoCAD you could hold down Shift and use the middle button (or wheel) on the mouse lock lock panning vertically or horizontally. In later versions (AutoCAD 2007 and on) you will notice that orbit (3DORBITTRANSPARENT) starts instead. Update: A reply in the discussion group also mention that if you first press down the middle button (or wheel) and then Shift it works as before. What you can do is using Ctrl and the middle button. It works the same way as before but you need to be stable on you hand to make it only pan up or down or to the left or right. But there still is a way to have it work as before. Use the command PAN (or 'PAN for transparent use) instead in combination with Shift and the left button or the middle button. If you want more control on panning you can use the command line variant of PAN namely -PAN in combination with either Ortho on or Polar on. That way you can select to pan exactly a specified distance or even at a specified angle. For more on PAN enter PAN on the command line in AutoCAD and press F1 for help. I wrote up more details on this as a response to a question in the AutoCAD discussion groups. and not a pan. Can I change this back? Update via email from Tracy Lincoln that I was approved to add here. Nice PAN tip, keep up the good work! You can use the command alias P for PAN and -P for -PAN... you can also use 'P and '-P for transparent use of these commands. If you have right-click time sensitivity turned off and shortcut menu selected (Options > User Preferences > Windows Standard Behavior Area > Right-click Customization...) then you can right-click with nothing selected and select PAN or use the a key. Image above from Boom Chameleon. More on 3D navigation. Maybe AutoCAD and other Autodesk software's soon will support the coming Microsoft Surface. Opticore is a developer of 3D real-time software for interactive product visualization. Here is a snapshot of a Swedish Volvo C70 rendered using Opticore. Press release and the Opticore AB website. "The acquisition of Opticore technology is part of Autodesk's commitment to set the direction for Digital Prototyping and offer a complete solution across the Manufacturing industry," said Robert "Buzz" Kross, senior vice president, Autodesk Manufacturing Solutions. "By adding Opticore products, Autodesk intends to offer the most complete design visualization solution in the market, providing automotive and product designers the opportunity to select the most cutting edge visualization product that best meets their needs." No need to mark and copy from the command window. Even file contents can be copied to the clipboard. It also works with PowerShell. I like it and want it on my Windows XP. No problem. Just copy clip.exe (found in system32) from a machine with Windows Server 2003 (does not work with the one from Vista) and place it in the system32 folder on the Windows XP machine. I run into problem with Outlook 2007. When I selected Tools>Options>Mail Format>Signatures nothing happened. Restarted. Started in safe mode (holding down CTRL during start). No dialog box showed up. The solution that helped was to run Microsoft Office Diagnostics available at Help>Office Diagnostics in Outlook. Also at: Windows Start Menu\Programs\Microsoft Office\Microsoft Office Tools. Did you know it is possible to link cells between tables in AutoCAD? Select a cell in another table and you will notice a formula like this. The formula options Sum, Average and Count can also be used like this. 2127834720 or whatever shows up is the Object ID for the table. If you save the drawing, close it and open it again you will notice that this value has changed. This is because the Object ID is just a file session valid value. Notice that only numeric values can be cross linked like this. If you select a cell with text in it you will only see ####. But if you have ADT (Architectural Desktop) or ACA (AutoCAD Architecture) you will notice that you cannot link to a cell in a Schedule object (AEC_SCHEDULE_TABLE). You can convert a Schedule to a table if you right click on the schedule and select convert to table. How about text object (TEXT or MTEXT)? You can Insert a Field (CTRL+F) and in the Field Category select Objects and then select the field name Formula. Now you will see the buttons for Average, Sum, Count and Cell. If the number of rows in the table changes to let’s say from 3 to 2 the formula doesn’t change and the value that shows up after running Tools>Update Fields (command UPPDATEFIELD) shows #. The formula has to be changed to have a valid range to show the correct value. If you add a new row above the source row you will also notice that this needs to be handled manually. You might also need to run REGEN to have the tables updated. Design Review’s Digital Light Table - The CAD Geek Blog - About how to compare DWF files. Is CAD coming to a table near you? - BLAUGI - a post on the amazing Microsoft Surface. Creating an AutoCAD table containing block images using .NET - Through the Interface - A lot of .NET for AutoCAD. When can I expect right click customization for my mouse? Wildfire 5.0 will have better customization. It may have right mouse functionality. The main problem is making the right mouse menu context sensitive. Other CAD related blogs I read are found on the blog's right side. Let me know if I miss a blog there. I read my blogs using Google Reader and the blogroll on the right side is from Bloglines so it is not always up to date. Adobe Acrobat 8.1 and Adobe Reader 8.1 are now available for download. In Acrobat, check the Adobe Updater (Help menu -> Check for Updates) to look for the update. You can also directly download Adobe Reader 8.1 or Adobe Acrobat 8.1 update. I tried to use Check for Updates but it failed somehow so I had to download it manually. Print documents to a FedEx Kinkos office in the United States. Easily extract documents from a package. Search and print the current or selected document, or all documents within the package. Read and organize eBooks and other publications with Adobe® Digital Editions (a separate product). When you first click the Digital Editions menu item, you can download and install the Adobe Digital Editions software. After installation, choose Digital Editions to go directly to your Adobe Digital Editions bookshelf. Acrobat 8.1 provides a FIPS mode to restrict data protection to Federal Information Processing Standard (FIPS) 140-2 approved algorithms using the RSA BSAFE Crypto-C 2.1 encryption module. This article has more information on enabling FIPS mode. 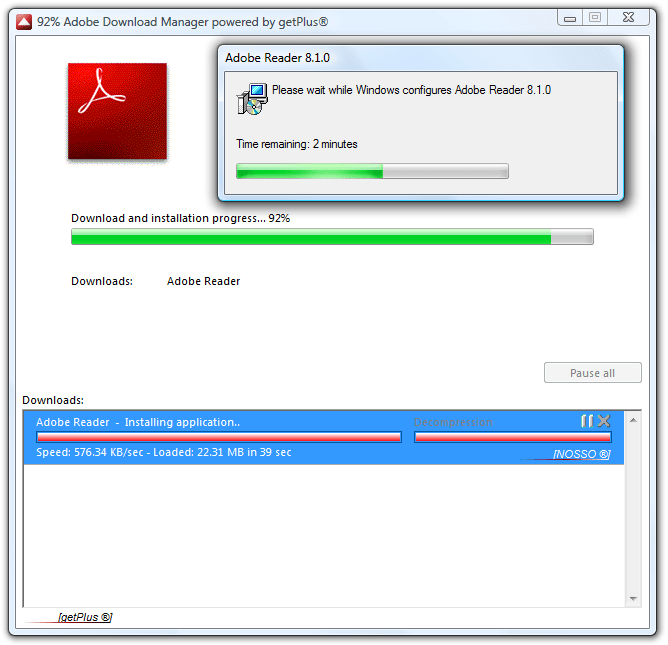 Adobe Reader 8.1 can be downloaded here. Remember to uncheck Adobe Photoshop® Album Starter Edition as well as Free Google Toolbar on the following page if you don't want it. If you have Windows Vista you might get the User Account Control warning a couple of times. Just give it permission to continue. A new download manager as you can see. I was asked to restart the computer and a second after I had selected that I will do that later I got this System Modification Attempt warning by my antivirus software F-Secure. What it actually warns about is that the Adobe Acrobat installer wants to continue next time you start your PC. So I just selected to trust the application. Here is what it look like in Word 2007. It uses the new Ribbon/Fluent UI. Disclaimer. I got a free copy of Acrobat 8.0 as incentive to make some buzz around Acrobat so this is not the first and probably not the last post on Acrobat. I have tried Tagspace before but never ended up using it. Let's see if I might start using it now. I'm still not convinced though. Here is the RSS feed for the AutoCAD tag. Tag Practically Anthing on the Web--Apply tags to practically any site on the World Wide Web, excepting those that are known to contain offensive, malicious, and otherwise inappropriate content. Browse Member Tags--See what other users have tagged and view their personal tag clouds, by clicking on their display names. "Tag Drafting"--Subscribe to the RSS feed for a tag (like tagspace). "Member Drafting"--Subscribe to the RSS feed for other members' public tagged items (my Tagspace RSS feed here;-), by clicking on their names and subscribing to the RSS feeds associated with their tagged items lists. "Tag Drafting" and "Member Drafting" are excellent ways to stay up to date, diminish information overload, and approach what I like to call "domain omniscience", at little expense to yourself. What bookmarking or tagging system do you use and why is it useful? If you usually work with the Properties palette you might wonder how to lock the scale or access other properties on nonrectangular viewports. Here is when a rectangular viewport is selected. But when a nonrectangular viewport is selected it looks like this. The reason for this is that a polyline is added and works as a clipping entity for the viewport. What you need to do is to take the extra step and in the drop-down box where it says All (2) select Viewport (1). Now you can see that the properties are available. A quicker way though is to select the viewport, right-click and select Display Locked>Yes. Here is a little about viewport locking from the help documentation. By locking the viewport scale first, you can zoom in to view different levels of detail in your viewport without altering the viewport scale. Once you set the viewport scale, you cannot zoom within a viewport without changing the viewport scale. By locking the viewport scale first, you can zoom in to view different levels of detail in your viewport without altering the viewport scale. Scale locking locks the scale that you set for the selected viewport. Once the scale is locked, you can continue to modify the geometry in the viewport without affecting the viewport scale. If you turn a viewport's scale locking on, most of the viewing commands, such as VPOINT, DVIEW, 3DORBIT, PLAN, and VIEW, no longer function in that viewport. NoteViewport scale locking is also available for nonrectangular viewports. To lock a nonrectangular viewport, you must perform an extra step in the Properties palette to select the viewport object rather than the viewport clipping boundary. On the topic of viewports. The clipped viewports or so called nonrectangular viewports on the images where created using the MVIEW command and then selecting extisting polyline objects. Objects allowed are a closed polyline, ellipse, spline, region, or circle. The polyline you specify must be closed and contain at least three vertices. It can be self-intersecting, and it can contain an arc as well as line segments. Here is a patent on Reactor-based viewport clipping using arbitrary graphical entities. Viewports where introduced with AutoCAD R11. Nonrectangular Viewports where introduced with AutoCAD 2000. New viewport layer properties where introduced with AutoCAD 2008. These new properties enable you to apply layer properties on a per-viewport basis. Independent LT scale per viewport. Viewport Layer Freeze. The new annotation functionaly makes it possible to display objects differently in individual viewports. Create a polyline in modelspace based on a viewport. Speed up your work when you work with viewports. The undocumented SPACESWITCH system variable makes it possible to lock usage of double-click to enter into model space. AutoLISP sample code to get viewport scale even for clipped viewports. AutoLISP freeware program VPlayers.lsp to save, load, copy layer settings per viewport. AutoLISP code vpsel.lsp to select all visible objects in selected or active paperspace viewport. Creation of viewports using AutoLISP. The readme for AutoCAD 2008 has things to say about viewports that is good to know. I just watched this presentation by Aaron Boodman at Google about Google Gears. Interesting. Aaron is the one behind Greasemonkey for Firefox. Prev. post on Google Gears. I previously mentioned how IE7 crashes when clicking on some dropdown boxes. I have a sample of a drop-down box in that previous post. I also notice lately many strange crashes in Access 2007 like when I tried to create a simple query. The workaround was to start the application as administrator. Finally I was able to isolate the problem to having Start++ running so I have notified Brandon about it in his forum and he is looking into the problem. "it's a problem with any application that uses the System.Windows.Automation library and registers event handler on Automation events"
By the way I miss having Start++. Start++ is an enhancement for the Start Menu in Windows Vista. It also extends the Run box and the command-line with customizable commands. For example, typing "w Windows Vista" will take you to the Windows Vista page on Wikipedia! Annoying bug in Google Reader. I cannot use the keyboard shortcuts like j and k. At least I'm not alone. It works for a while but then it stops and I have to restart Google Reader to get it working for a short while again. Google Gears is a really exciting development and one practical usage is already available. Google Reader can go offline. The setup and installation is easy. So now you can use Google Reader on the airplane or the buss and when you go online again information on what you have read will be synchronized. Images are not available offline though. Hopefully this will be added later on. When using Save As in Microsoft Word 2007 it is supposed to save to the same folder as the document you have opened. But I have noticed that once in a while it opens up to another folder. If I try again it comes to the correct folder. A tip for quick access to Save As or other commands is to add it to the Quick Access Toolbar like this. Just click on the black arrow to the right of the Quick Access Toolbar to customize it like you want. Select "More Commands...". Select "All Commands" in the drop-down "Choose commands from". But if the debug log grows too large you might end up with not accessing the license server licenses. The path to the debug log is usually set using lmtools.exe>Config Services>Path to the debug log file but if the vendor deamon is restarted the debug log will be overwritten. If you don't want that to happen you need to create the options file using a text editor like Notepad.exe. It should be named like the vendor deamon but with the opt file extension. For example Autodesk's vendor deamon is named adskflex.exe and the options file should be named adskflex.opt. Place the file in the same folder as the license file and you don't need to edit the license file to point out where the options file is located. Add this row to make sure that the debug log is added to instead of overwritten. Notice the + before the path. Double quotes are needed if there are spaces in the path. The syntax for NOLOG is as showed below. Notice that the options need to be on separate rows as in the example above. NOLOG suppresses logging the selected type of event in the debug log file. NOLOG can be useful to limiting the size of the debug log but you loose maybe valuable information so you can make a habit to backup the debug log once in a while instead. Reference: FLEXNET LICENSING END USER GUIDE.